Speaker wires play a crucial role in the performance of a home theater or audio system, but they may be the “least-appreciated” component in the system. When these wires are chosen and installed properly and are doing their job as designed, they’re never even noticed. After all, speaker cables don’t have cool digital readouts or modern appearances. In most cases, they’re not even visible. Poor-quality or mismatched speaker wires, however, can turn a showcase audio/visual installation into an expensive disappointment, delivering sound that isn’t much better than the audio produced by the speaker in an HDTV. Let’s take a look at the key factors in choosing one of the key components of a home theater. It’s understandable when homeowners spending hundreds or thousands of dollars on equipment for a new HDTV, audio or theater system figure they shouldn’t pinch pennies on their speaker wires. That approach leads many to spring for ridiculously-expensive cabling that promises “ultimate performance” thanks to features like oxygen-free copper wire, specially-designed interior magnetic tubing and “hybrid geometry” (whatever that means). Those features are usually just marketing-speak designed to sell speaker cables at unjustifiably high prices that no one should ever pay for speaker wires. Believe it or not, there are even companies that sell a 12-foot length of speaker cable for more than $7,000. Spending too much for speaker wire is one extreme that might seem to make sense, but doesn’t. Then, there’s the other extreme. When doing cursory research into the subject of speaker wires, many people hear phrases like “all speaker wire is the same” or “there’s no point in buying expensive speaker cables.” That leads them to buy the cheapest speaker wires they can find, expecting there will be no consequences. The phrases are largely true – but they’re not meant to be taken literally. The points they’re making are that all quality speaker wires will sound the same for home use, and that there’s no need to spend a fortune for “advanced” cables which will perform just as well as reasonably-priced ones. The moral of the story? Unless you’re a dedicated and knowledgeable audiophile or you’re wiring a professional audio studio, you shouldn’t spend a ton of money on speaker cables. Nor should you use leftover wire you find in your garage to hook up your audio system. All you need are affordable speaker wires that meet your needs, as long as they’re from a reputable manufacturer. The purpose of speaker wires, of course, is to transfer analog audio from receivers or amplifiers to a system’s speakers. The transfer is accomplished through the low-voltage electrical current conducted through the wires. Speaker wires should allow the current to pass from one end to the other as easily as possible, so that the full range and power of the audio can reach the speakers. That means using wires that minimize “resistance” to the passage of electricity. Three properties factor into the resistance of a cable. Thickness: As wire gets thicker, more space is available for electrons to pass through – so thick wire offers less resistance to electrical signals. The thickness of wire is measured in “gauge” (often abbreviated as AWG, which stands American Wire Gauge”), and the lower the gauge, the thicker the wire. 14-gauge speaker wire, for example, is thicker than 18-gauge and offers less than half the resistance to audio signals. Naturally, thicker wire will cost more than thinner wire. Conductivity: You certainly know that some materials conduct electricity better than others. 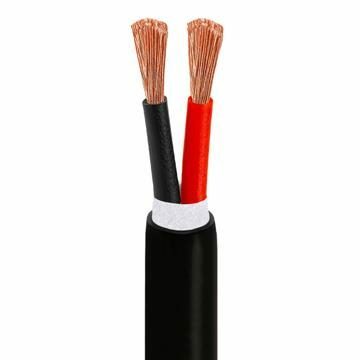 One of the best conductors is 100% copper, which is the standard for speaker wires and the best choice. Some expensive speaker cables feature oxygen-free copper, specially refined so it doesn’t contract or expand with heat and supposedly offering higher audio performance. Quite honestly, you won’t notice a difference. You can also purchase copper-clad aluminum speaker wires at a lower price than 100% copper; in most home systems you won’t hear a difference, either. Here’s the takeaway from all of this: 100% copper speaker cables are best, you shouldn’t use longer speaker wires than you need, and the gauge should be optimal for the task. How do you know what gauge is optimal? There are complicated formulas and charts that audio geeks use, but these rules of thumb should be more than enough for most people. Before reading them, find your speakers’ impedance (another way to say resistance), which should be listed on the back of the speakers or in your owners’ manual. You can always use thicker speaker wires than we’ve listed, of course, but since thicker wire is more expensive you may end up paying more than necessary. Speaker wires can be purchased with or without audio connectors, and not all connectors are compatible with all speaker or receiver terminals. Two types of speaker terminals are standard, binding posts (the ones with screw caps that tighten onto a metal rod) and spring clips (the ones that let you push down a clip to slip a wire into the hole behind it). Spring clips are more secure. If you buy speaker cables without audio connectors, the bare wires will work with spring clips but will be difficult to connect to binding posts; you’ll probably have to use banana plugs or attach spade connectors. If you’re buying speaker wires with audio connectors, be sure they match the terminals (pin connectors for spring clips, spade connectors or banana plugs for binding posts). You can buy speaker wires with either two or four conductors. Two-conductor wire is self-explanatory, but four-conductor speaker wire is handy for running cable to a wall-mounted volume control, or for using a single run of cable to connect two speakers in different parts of a room (“stopping off” at the first speaker to attach two conductors, and then continuing the run to attach the other two conductors to the second speaker). Finally, be sure that speaker wires have the proper UL rating (CL2 or CL3) if you’re going to run in them in walls or ceilings, or that they’re outdoor-rated cables if you’re going be running them outdoors. The only other consideration that’s important is making sure your cables have been manufactured by a reputable company like Cmple. We offer an enormous range of high-quality speaker wires in all gauges, lengths, ratings and jacket types, all at our always-low prices – and without the unnecessary gimmicks which just add to the price tag. Now that you know the type of speaker wires you’ll need, you’ll be able to find them easily.